timeless styling ethermonkey. are you still in the detroit area or am i a foolio. Indeed I am. Come over, I'm lonely! OK, so that was a really amazing tip from Flagman! Other than that it just works! Its a little slower to load, but seems to run well enough. Saving works. For me, it left the drawing open after saving. I don't know if that's great, so everyone should probably close it after saving. Yanbu, this sort of addresses some of the things we'd been talking about. I'm really impressed! Waterfox asks to update java. Should I or is this a "nonono!!!" ???? Yeah, that's the behavior I was seeing as well. 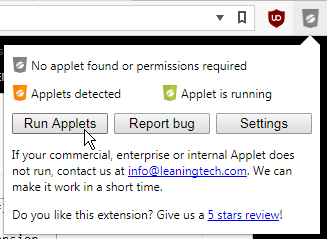 I didn't notice the applet was frozen though. That's sorta better. I was worried about the same draw being saved twice...I'm not sure if the 10e's code would like that. Otherwise, it's not harmful, just gotta manually close after saving. As far as updating Java: I think it's safe so long as you stay with version 8. They just pushed out version 8 u171, which should be OK. But, at the same time, if you're only using Java for 10e, and disallow it everywhere else, it's kinda fine to not update it too. esp, it's really nice to see your draws again! thank you i have missed all the good people at 10e, it`s good to be back. Picked up my new XDs. Between the new computer and now this....I'm officially broke. I ran across this sight called "Cheerpj" Its a Java compiler for web applications. Its from a company called Leaning Technologies Limited. Is this a program that could solve the windows/ java issues on this site? You ever heard of this? Interesting! Good find, it does look potentially useful. Have to give it a try. Pale moon works! Had to go into the security settings for moon and click "Allow" for the Java setting. Going to sign out and see if I can re enter. Many thanks DS for suggesting this and all your hard work on this problem. YASSSS! Glad to hear it!!! I had to set up a new laptop. The screen on this old one is dying. Set up Internet Explorer on the new laptop but cant use 10E. I get a security prompt blocking java from working. Java is up identically to my old laptop but no go. Waterfox doesn't work either. Any ideas? I may take the new laptop back and just see if I can get the old one fixed. I've taken some screen shots. Where do you need me to send them? I get a security warning about the program being blocked due to security settings. On WaterFox all I get is a blank page, no warnings or security prompts. If you could, toss the shots up on imgur.com and link here in a comment. Actually, I made an example. Does it look like this? That is exactly what it looks like. I tried your setting example in the control panel but get the same warning. You might have to close all the IE windows before it takes effect. I got bit by that once. If that doesn't do it, then I'm not sure. This is one of those "it should be working" type things. 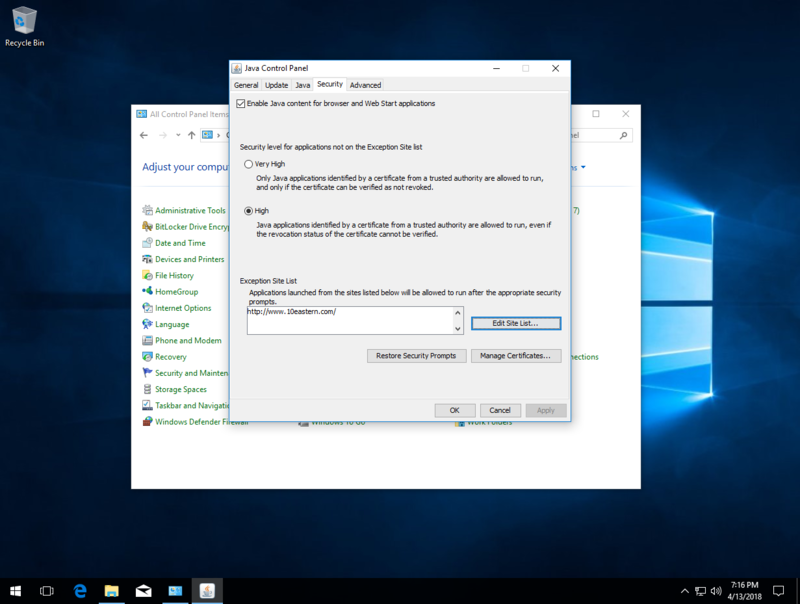 I don't think I changed any other security settings on my Win10 test machine other than the ones I showed. I need to go take some meds. My carpel tunnel syndrome is acting up. I'll check in in the morning. Would it be possible to do a remote access off this machine? Remote access: Possibly? I've never really tried with anything that wasn't really Linux-y. I'll do a little reading about it and get back to you tomorrow if you still have no luck. Rats, never mind the slashes idea. I just tried it and it doesn't seem to make any difference. Ok, one last comment, but I think this might be it. Judging from your screen shots, you're going to http://10eastern.com and not http://www.10eastern.com and the missing www does make a difference. So, add another security exception for http://10eastern.com or add the www to the url in IE. Added the www. but no go. 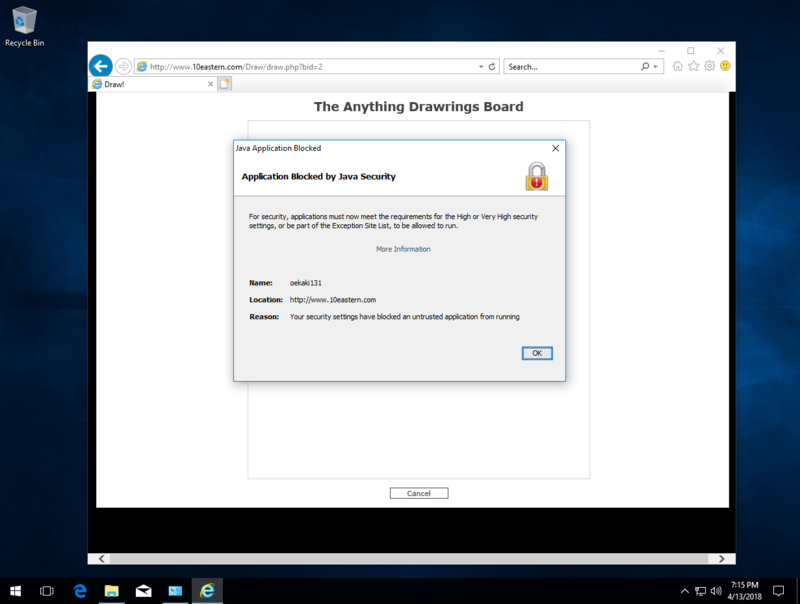 Is it possible that antivirus or windows security is preventing this? It's possible? I sort of don't think so because the message is coming from Java itself, so its getting pretty far in the process. I'd expect antivirus or whatever to block it sooner. Shoot me an email (in my profile) if you wanna try more stuff. I sent you an email. I'll be on and off the site through out the evening. Email failed to send. I added my email to my profile. Sorry, I'm not much for precision. Time to eat dust again.